Police are appealing for witnesses after the man suffered serious injuries in an altercation. Two men were seen running down Railway Approach around 8.10pm when a physical altercation occurred. 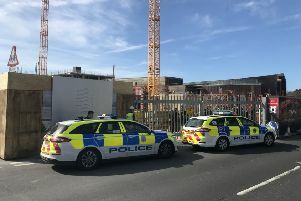 Police said a man, in his 20s, suffered serious injuries, believed to be caused by a knife, and was taken to hospital, where he remains in a stable, and not life-threatening, condition. The suspect is described as a white man, early 20s, fair haired and was wearing a dark coloured t-shirt. Prevention Inspector Allan Lowe said: “This violence is obviously distressing but I can assure local people that we are doing all we can, taking targeted action to help keep them safe. “Criminality that puts people’s lives at risk is never acceptable and it’s vital that the community pulls together to help us deal with those responsible. “I understand that residents will be concerned by violence taking place in the town but I want to reassure everyone that their safety is our priority. “We want to speak to anyone who may have witnessed the incident to get in contact with us. To report information call 101, quoting reference 1261 of 21/09.